Sadly, all living things die. While you can never be completely prepared for that time, what is offered by Dr. Wallace Sife in these pages can help you draw upon new strength to ease your grief and pain. 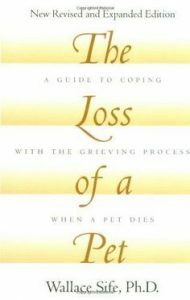 In this fully revised and expanded edition of the award-winning book The Loss of a Pet, Dr. Sife, one of the pioneering authors and counselors in the field of pet bereavement, covers all viewpoints of bereavement for a beloved animal companion. This book includes practical suggestions, as well as brief case histories, and illustrates the insights that Dr. Sife has gleaned from his many years of experience. In addition to helping the reader cope with the death of a much-loved pet, The Loss of a Pet addresses pet losses that are not death-related. Dr. Sife has specially designed this book to help you learn more about yourself through the grieving process and to successfully cope with this unique kind of loving and grief?and, most importantly, to help you realize that you are not alone. Three weeks ago, we lost our 8-year old Boxer, Taylor, to Lymphosarcoma. We took her to the very best Oncologists(several of them), spent thousands of dollars in trying to keep her with us for as long as possible, but in the end we knew it was time for us to let go. Not having children, the pain of losing such a loving animal was beyond my expectation of grief. When I researched the list of books on pet loss, I was looking for facts on how to deal with this agony and pain. Dr. Sife’s introduction and chapters on this subject matter was a validation that what me and my husband were feeling and going through were normal. Dr. Sife’s case histories throughout the book were very helpful in applying what other people have experienced and what we were going through. For anyone who has recently lost a pet and is looking for some insight on the feelings they are experiencing, I highly recommend this book. He is very factual. If you are looking for a spiritual or religious aspect, this is not the book. Although Dr. Sife does touch on this subject in a chapter, the basis for the book is the psychological aspects of losing a member of your family.